The 2017 Honda Civic is one of the market's best options for a stylish and practical vehicle at an affordable price. The latest engineering and features have been inserted into Honda's famous mid-level Sedan. A car for the minimalist and the extravagant, it includes aids for safety as well as innovative entertainment technology. Take a sneak peek into the 2017 Honda Civic to see if it's a good option for you. Welcome to luxury and class with all of the amazing features Honda has included in their newest rendition of the Civic. Right off the bat we see it comes packed with a powerful 158 horsepower engine (up to 174 horsepower with Turbo) and with a 6-speed manual transmission model as an option as well. The vehicle gets as much as *32 city/42 highway mpg. Honda also includes a Continuously Variable Transmission (CVT) to maximize fuel-efficiency without sacrificing performance. The body itself is lightweight to allow for sharper turns and smoother driving. The 2017 Civic's compact size (while still maintaining its spacious interior) makes for easy maneuvering in tight spaces and increases available sight to the driver. Connect to your favorite music, apps, news, and even audio books with the Civic's available SirusXM Radio option. There are even tailored applications for you iPhone (Apple's Carplay) and Android (Google's Android Auto) users out there. 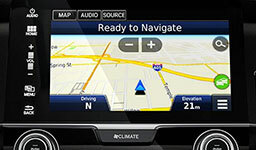 See an interactive view of your smartphone's features right from the car's touch-screen interface. With this you can access your music library, see text messages, and get live directions with only a few taps. In the realm of safety, the Civic doesn't disappoint. The innovative Lane Keeping Assist System alerts the driver when the vehicle is veering out of the lane and even will make small corrections when needed. Adaptive Cruise Control is offered so the driver does not have to manually adjust speed when approaching another vehicle under cruise control. The 2017 Civic will detect the distance, reduce the speed, and increase it again when the way is clear. Finally, the Civic will also alert and attempt to prevent oncoming collisions by calculating distance and applying the brakes in what seems to be an inevitable crash situation. The 2017 Civic was given a **5-star overall rating by the National Highway Safety Administration. The capstone of Honda's 2017 Civic lineup is the Touring model. It comes equipped with everything from beautiful interior leather to heated seats and all of Honda's smart Honda Sensing technology to make driving even more of a delight. 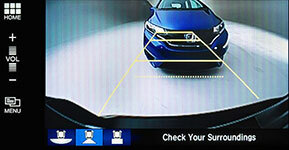 Get an accident-preventing view of the rear of your vehicle to prevent possible collisions. Get up-to-date GPS capability with Honda Satellite technology. 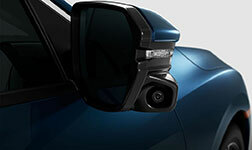 Changing lanes has never been easier now that cameras on the side mirrors give live video when changing lanes. No need for pesky cables with Honda's built-in wireless charge mat for your favorite smartphone. The 2017 Civic is one of the most all around practical and excellent vehicles on the road today. With the perfect blend of vital base-model safety and convenience features along with a host of add-ons, it is a vehicle worthy of praise because of its customizability. Whether this is a business or family vehicle, the Honda Civic is versatile enough for any task you may have for it.